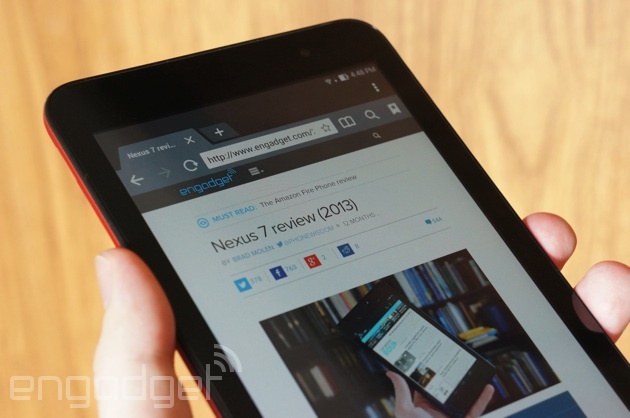 The MeMO Pad HD 7 was arguably the sleeper hit among small tablets in 2013. ASUS' device didn't have the speed of the Nexus 7 or the interface tricks of Samsung's Galaxy Tab 3 line, but it was superbly balanced. It ran smoothly, packed smart software and (most importantly) carried a sub-$200 price. For that reason, this year's MeMO Pad 7 and 8 are potentially exciting; they stick to that familiar formula while bringing in faster processors and a fresher interface. What's not to like? As you'll find out in our review, there are a few aspects that definitely need improvement, or even take steps backward -- but it's also clear that ASUS has budget-tablet design down to a science. The MeMO Pad 8 delivers a pretty big punch for a $200, 8-inch tablet -- just be aware that a few rivals offer sharper displays for similar cash. How would you rate the MeMO Pad 7? The MeMO Pad 7 is easily one of the fastest 7-inch tablets you can get for under $200, but you'll miss out on extras like high-quality cameras and video output. The strongest evidence of ASUS' if-it-ain't-broken philosophy manifests on the outside. If you've used either the MeMO Pad HD 7 or HD 8, the basic layouts of their MeMO Pad 7 and 8 sequels will be very recognizable. And that's mostly a good thing. They're easy to hold, with rounded edges and side buttons that you're unlikely to hit by accident. You'll find micro-USB and headphone ports on the top, the power and volume controls on the right and a microSDXC storage slot on the left. There's little on the front besides the company logo and the front-facing camera (0.3 megapixel on the Pad 7, two megapixels on the Pad 8). On the back, you'll spot a rear camera above (two and five megapixels, respectively), and stereo speakers below. That's not to say that ASUS is simply recycling its hardware. Both of the new entries are a tad thinner and lighter than their predecessors. The 7-inch MeMO Pad 7 is the featherweight of the bunch, at 0.65 pound and 0.37 inch thick; its 8-inch counterpart is unsurprisingly heavier, at 0.7 pound, but it's also slimmer at 0.3 inch. The designs are narrower than last year's models too (4.4 and 4.9 inches, respectively), so they're ever so slightly easier to grab with one hand. I was happy to use either for significant stretches of time without propping them up on my lap; these are fine devices for reading on the couch or playing games that demand a two-handed grip. That conservative design approach does mean the MeMO Pads inherit a few flaws. Those buttons may prevent unintended presses, but they're also harder to activate on purpose. Since you can't see them most of the time or quickly identify them by feel, it's all too easy to accidentally lower the volume when you meant to put the device to sleep, or vice versa. The matte finishes also have their quirks. The 7-inch slate's smooth backing tends to stay relatively pristine (at least in a red hue), but it's a bit slippery; the textured 8-inch model is more stable in my hands, but it picks up lint like nobody's business. 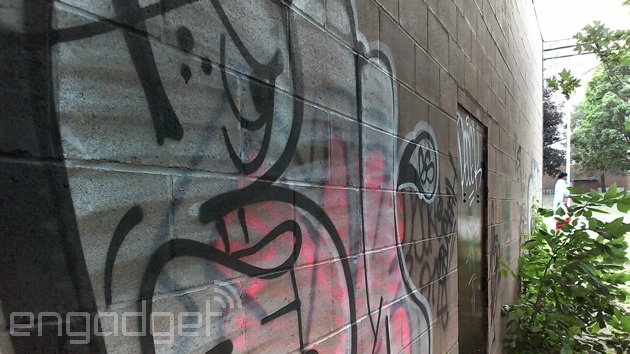 The MeMO Pad 8's new camera layout also doesn't do anyone any favors. ASUS has moved the camera from near the center to the corner, making it a little too trivial to block the lens when you're shooting. 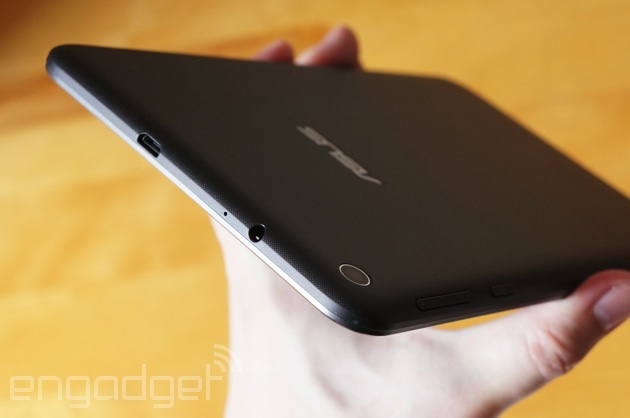 The Pad 7's rear shooter is in the same position as on the HD 7, though, so you won't easily smudge its glass. Not much has changed on the inside apart from the processor, although that's not shocking given that the Pad 7 and 8 cost just $150 and $200 respectively. In US models, you'll still see 16GB of built-in storage (11.1GB free), 802.11n WiFi and Bluetooth 4.0. Sadly, there's no HDMI output, so you'll have to lean on Miracast streaming to send video to a TV. 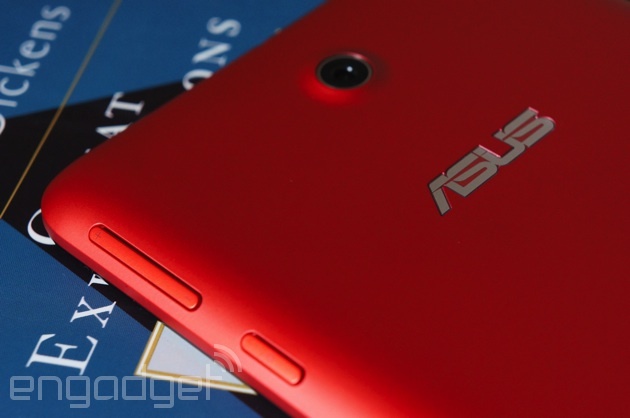 ASUS does have an ace in the hole with its built-in GPS and GLONASS positioning, however. You can use any of these devices for navigation so long as you have offline maps; many rivals, including iPads, can't do that unless you buy their cellular-equipped variants. Although the MeMO Pad 7 and 8 are separated by an inch in screen size, you get the same basic display technology: a 1,280 x 800, IPS-based LCD. Neither tablet's screen is especially sharp (the Nexus 7 and Dell's Venue 8 have much crisper-looking 1,920 x 1,200 panels), but they're reasonably attractive for the price you're paying. Both deliver rich colors that aren't overdone, and you only really lose brightness when you look at them from sharp angles. There are a few practical differences beyond the raw surface area, mind you. 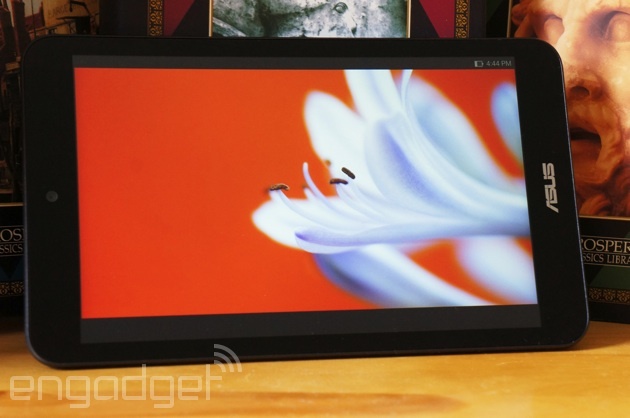 The Pad 8's display is a bit brighter, at a high 400 nits versus 330. Either model is easily visible indoors, but you'll definitely want the larger slab if you venture outside. I also noticed that the Pad 8 had a warmer, slightly yellowish color cast out of the box, although ASUS' Splendid screen utility makes it easy to dial that out. Really, it all comes down to dimensions. Just how much screen real estate do you need? Having held the two MeMO Pads side by side, I can safely say that you'll want the 8-inch version if you can at all swing the extra cash. It's much easier on my eyes for long gaming and reading sessions, and it gives me more overall breathing room than I get with the cramped 7-incher. The lower pixel density isn't a problem at normal viewing distances, in my experience. The tinier hardware will do if you don't have the money or free space for the bigger hardware, but it's tougher to justify in an era when many smartphones aren't that much smaller. There's a similar split when it comes to sound quality. While the MeMO Pad 7's stereo speakers are clear-sounding, they're a bit quiet and lack even the vaguest hint of bass. The Pad 8 isn't an audio powerhouse, but it produces louder, fuller output that's just good enough to make me forego my headphones. With that said, the stereo separation on both tablets is virtually nonexistent. I'd really like to see ASUS put the speakers on opposite ends, like it does with the larger Transformer Pad TF103C. If you've read our review of the new Transformer Pad, you'll know what to expect software-wise. The two MeMO Pads are running the same ZenUI interface, which spruces up Android 4.4.2 KitKat with a trendy "flat" look and a handful of customizations. ASUS strikes a careful balance between adding its own flourishes and leaving Android's better features alone. You'll get quick settings, some well-done media galleries and app drawer sorting, but multitasking and most other Google-made elements remain intact. Yes, that means you'll miss out on multi-window support and other perks from heavier Android skins, like what you get on Samsung's Galaxy Tab 4 line. Still, it's hard to object to ZenUI's more restrained approach -- it's simple, colorful and responsive. There isn't an avalanche of preloaded software, either. ASUS' own titles are dominated by simple utilities like the previously mentioned Splendid display tool, What's Next (a simplified calendar view) and Do It Later (a to-do list). The more substantial apps are a mixed bag. SuperNote is great for scribbling and typing notes, but I just couldn't find a use for Story's diary-keeping abilities. The third-party app selection, meanwhile, is small, yet smart. Flipboard and Kindle are practically must-haves for reading, and I can see some subscribing to either eMusic's song-download service or some of Zinio's magazines. *SunSpider: Lower scores are better. **Average score for the 7- and 8-inch models. ***Average score for the 8.4- and 10.5-inch models. Don't expect to see a performance gap between the two MeMO Pads... or the TF103C, for that matter. They're all using the same quad-core, 1.33GHz Atom Z3745 processor with 1GB of RAM, which means the benchmark scores are virtually interchangeable. Not that there's much room to complain. As you can see above, either of the entry-level tablets can match or beat more expensive challengers. It's not shocking that they can outpace ASUS' own Nexus 7, a year-old device using an even older processor. However, they also fare well against Amazon's speedy Kindle Fire HDX, and even the premium Galaxy Tab S 8.4 -- not too shabby when you're paying up to $250 less. The numbers translate well to the real world. The Atom chip doesn't break a sweat while navigating through the interface, and it's equally adept at both web browsing and intensive 3D games like Real Racing 3. As I touched on with the Transformer Pad, the low resolution goes some way toward easing the workload. You don't need a rocket to power a paper airplane, after all. However, the offscreen graphics tests suggest that neither MeMO Pad would have much trouble handling 1080p. It's just a shame that the displays can't match the might of what's under the hood. More memory would be nice, too. Although the devices didn't get bogged down as I juggled different apps, it's evident that 1GB of RAM isn't quite enough for very demanding apps. One benchmark I ran would randomly spit "out of memory" errors, even after rebooting to give it as many resources as possible. You might never encounter these problems yourself, but I'm concerned that the MeMO Pads could choke on software a year or two down the road. I don't have similar reservations about the battery life. Where the Transformer Pad TF103C's runtime was disappointing for its size class, both the MeMO Pad 7 and 8 are at least on par for their price tier, if not a bit above average. ASUS claims that both of them should last for nine hours when looping a 720p video at a low 100-nit brightness, but that's fairly conservative. In my testing, which upped the brightness to the halfway mark and threw in periodic updates from Facebook and Twitter, both gadgets were still within the ballpark of that official estimate. The 7-inch unit managed a respectable eight hours and 36 minutes before shutting down, or enough to trump the current Nexus 7 and multiple older Samsung tablets. Meanwhile, the 8-inch model lasted for nine hours and 21 minutes, putting it ahead of both the TF103C and Sony's Xperia Z Tablet series. Neither result holds a candle to the longevity of the Galaxy Tab S, ASUS HD 7 or most iPads, but they're more than acceptable given the blend of raw power and discount pricing. And in real life, the battery is healthy enough that you likely won't notice the difference. I can get through a day of moderate browsing, social networking and photography even on the MeMO Pad 7, and I had less to worry about with the Pad 8. Heavy-duty gaming chews up a lot of that precious energy, although you can counter that by invoking a special energy-saving mode that cuts internet access when the tablets aren't in use. It's a last-ditch measure, to be sure, but it might save your hide if you need a working device at the end of a daylong trip. 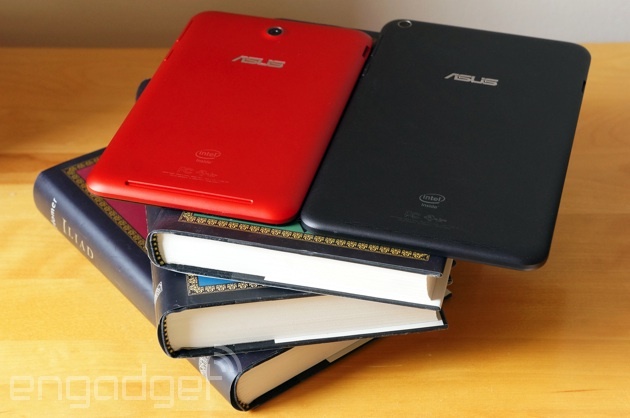 Here's where ASUS seemingly backtracks on its earlier successes. I lauded the MeMO Pad HD 7 for having solid cameras, but you're not guaranteed a similar experience with its 2014 follow-ups; to achieve what I saw in the HD 7, you'll have to spring for the costlier MeMO Pad 8. Its 5-megapixel autofocusing rear camera is nothing special with noisy low-light shots, blown-out highlights and processing that tends to erase finer details, but it generally produces accurate colors and can take reasonably well-exposed photos in dim indoor environments. The front 2-megapixel sensor is similarly unremarkable, but it's good enough for an HD-quality video call or selfie. Whichever camera you use, there's a fairly sophisticated set of filters and manual camera settings, so you can add an effect or tweak the white balance if an image isn't quite to your liking. It's the MeMO Pad 7 that you have to watch out for. ASUS has dropped the HD 7's 5-megapixel back camera in favor of a 2-megapixel, fixed-focus shooter, much like that in the TF103C. Predictably, the downgraded equipment is terrible -- you can't get close to many subjects without losing focus; colors are slightly off; and shots in anything less than good lighting generate an abundance of noise. Both this and the equally lackluster 0.3-megapixel front camera are serviceable if you only need to capture a chalkboard or join a Hangouts chat, but they're unfortunate regressions on a tablet that's otherwise a big leap forward. Just what represents competition will depend heavily on whether you're considering a MeMO Pad 7 or 8. The smaller slab may be the easiest choice. Poor cameras notwithstanding, the Pad 7 outmuscles much of what you'll find around its $150 sticker. Amazon's Kindle Fire HD, Barnes & Noble's Nook HD, LG's G Pad 7.0 and Samsung's Galaxy Tab 4 7.0 are slower and carry less storage. The Kindle and Nook don't even have any cameras to speak of, while LG and Samsung don't offer much more photographic prowess than ASUS. HP's Tegra 4-packing, $200 Slate 7 Extreme is no real threat either. 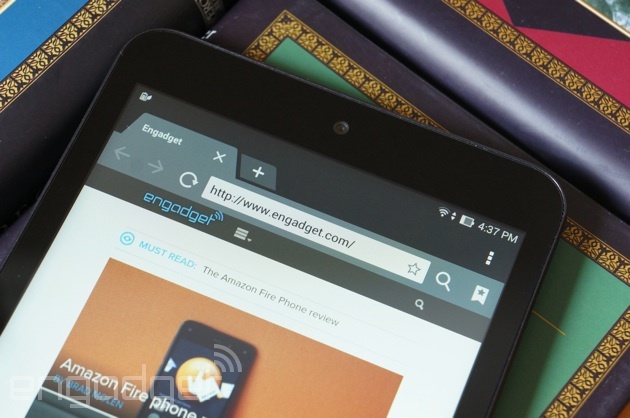 The biggest danger may come from Dell's Venue 7, which offers noticeably higher-resolution cameras (if also a slightly pokier Atom chip) for $10 more. Neither the Kindle Fire HDX nor the Nexus 7 justify their premiums as much as they did roughly a year ago -- $80 more gets you an exceptional screen and perks like the Nexus' wireless charging, but they're not faster. Move up to eight inches and it gets trickier. Frankly, the Venue 8 may be a better buy than the MeMO Pad 8 if you're interested in getting the best hardware possible for $200. It's using a dual-core Atom, but it has a far nicer 1,920 x 1,200 LCD for a similar hit to your wallet. You will get more for your moolah than other tablets can typically muster, though. The G Pad 8.0 isn't available in the US yet, and the $270 Galaxy Tab 4 8.0 is both more expensive and comparatively sluggish. If you're open to trying Windows, keep your eye on the Venue 8 Pro; Amazon affiliates frequently sell it for as little as $200, and it may be worth giving up some battery life in the name of a desktop-class operating system or (optional) pen input. Of the two MeMO Pads, I'd choose the 8-inch model without hesitation, as it's simply a better bargain. Spending $50 more nets you better cameras, longer battery life and that all-important larger display. The 7-inch system offers superb speed for a $150 tablet, but it's somewhat hobbled by the downgraded cameras. I'd make the sacrifice, as I rarely snap photos with any tablet, but it isn't as well-rounded as last year's MeMO Pad HD 7. It's a harder call when pitting ASUS against its opponents. While it should be clear by now that the MeMO Pads can take on most any task you'd expect from a mobile tablet, they're not the best at everything; you can find nicer screens and cameras without much difficulty, especially if you're willing to go beyond the $200 mark. I don't think that specs alone tell the whole story, though. 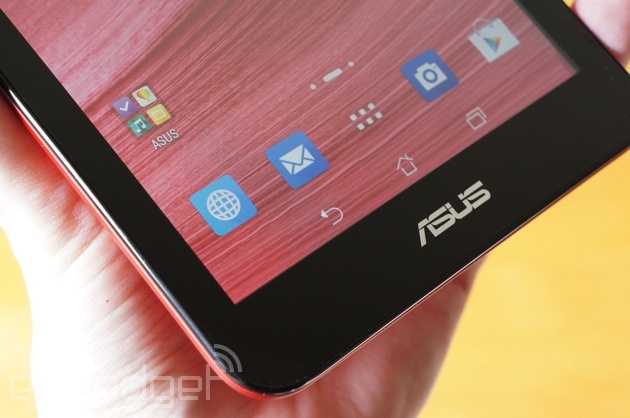 ASUS makes a good case for custom Android interfaces. ZenUI is more helpful than the largely stock Android implementation on the Dell Venue 7 or 8, yet it never gets in your way. I can comfortably recommend both the MeMO Pad 7 and 8, but you do have to be aware of what you're giving up -- these aren't so much sleeper hits as they are wisely calculated trade-offs.